Tragic, just tragic. Notre Dame is the heart and soul of Paris. I have been there to Mass a few times. I pray they can save it so it can be restored. Holy Week prayers ramped up another notch. 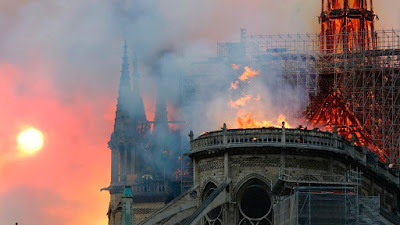 "IS THIS A MESSAGE FROM NOTRE DAME (OUR LADY) ABOUT THE STATE OF THE CHURCH IN FRANCE AND ELSEWHERE"
Are you suggesting Our Lady may have set fire to the building? That she whispered into her Son's ear and told him to let it burn? That she somehow inspired some carelessness on the part of the renovation crew? If so, you are accusing the Blessed Virgin on being an arsonist. Oh I'd say it's a sign. Perhaps prompted by Francis signing "The Document On Human Fraternity." More is sure to follow. Mount Satan's University would be a more appropriate name. Ironically the Shriver's and Kennedy's sponsor the Special Olympics which probably won't exist for much longer since so many people abort their less than perfect babies. P.S. 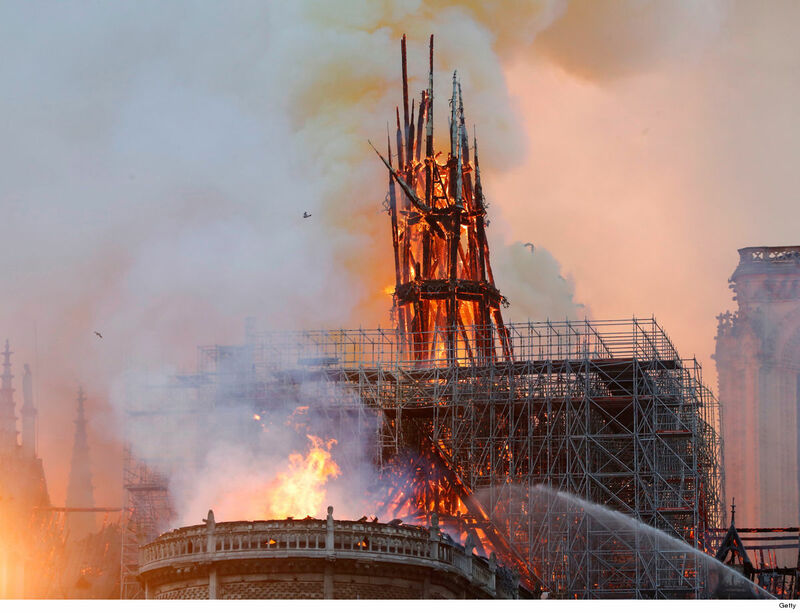 The article also noted that "By 11 p.m., Gen. Jean-Claude Gallet, the Paris fire chief, said that the structure, including the two magnificent towers soaring above the skyline, had been “saved and preserved as a whole,” but that two-thirds of the roof was destroyed." We'll have to wait and see about damage to the inside and rose window. I know the preservationist purists will want to restore the cathedral rebuilding the wood roof structure. Since it is not visible to the eye, I pray they use fire proof materials for the restoration. I am grateful there was no loss of life. Anonymous, it could be she did it to humble us and let us know that we are not so important. Let us know if you smell smoke. rcg - So you think the BVM is a criminal? Because, arsonists, or those who facilitate arson, are criminals. Did anyone suggest the BMV set the fire? "...and a sword will pierce through your soul also, that thoughts out of many hearts may be revealed." Anonymous is just another pain in the a__ troll, mocking the Church and us. We are all best served by letting him post his nonsense, ignoring him and refusing to take the bait. The fire may be a reminder for all churches to check their fire protection and safety programs---evacuation plans, sprinkler, fire detection and the like. Some years ago, a deranged person set fire to the pulpit at Savannah's cathedral, but thankfully it was extinquished before causing severe damage. Just as it is hard to imagine Paris without Notre Dame, so it would be hard to imagine Savannah without St. John the Baptist---nice when the tallest structure in the city is a church (here in Atlanta of course, no church would come close to being the tallest structure in the city). Pray and hope that it will be an offering as a Purge or L'Epuration would. A cleaning and a renewal. Isn't that what Easter is? Renewal of Life. Pray it be so. Notre Dame priez pour nous. Making a mockery of the role of the Blessed Virgin Mary in the economy of salvation is what is really dangerous. The BVM doesn't set churches on fire. She CAN'T set churches on fire. Blaming disasters on some Divine Will is also a very sketchy approach to understanding God's immanence. The disciples had a similar mistaken notion of Why bad things Happen To Good People. We just heard Jesus' admonition to them, "Or those eighteen people who were killed when the tower at Siloam fell on them—do you think they were more guilty than everyone else who lived in Jerusalem?" I note that no one every says, "My house burned down because God was punishing me" or "My army lost the battle because I have done evil." It's always the evil that befalls someone else that get's chalked up to God's supposed vengeance. "I note that no one every says, "My house burned down because God was punishing me" or "My army lost the battle because I have done evil." It's always the evil that befalls someone else that get's chalked up to God's supposed vengeance." Not at all true. But thanks for setting us all straight. Quite so! The materialist cathedrals erected to the glory of Mammon—the sky high office buildings and hotels—dwarf anything spiritual in Atlanta. But look on the bright side—at least the word T***p does not appear on any of them in golden letters (as far as I know). Question for the NON conspiracy theorists... have you EVER know any fire in any building to be publicly proclaimed to be unintentional while the embers will still glowing and hot? C'mon, they don't do this for house fires, much less than such an important and symbolic structure as the cathedral. The very speed of denying any and all involvement of intent and islam, helps to fuel speculation. It takes awhile to investigate a fire gloaters. Also A2, you are very selective in your "evidence" of lies in your attempt to mock others and make your self feel superior. I know that you could find many instances of attacks on churches in France. Why didn't you post those? My post was concerned with lies and falsehoods concerning Notre Dame. That is why I did not address other fires or attacks on churches. Whoever is behind these attacks and other incidents, they are quite horrible. And I am not seeking to mock anyone or appear superior. As I have indicated on another thread, I am interested in defending truth and facts. “Snake tactics” are also an attack on God. And if the perpetrators of the conspiracy theories discussed in the links I posted earlier are so sure of themselves, why do they need to lie?